So, I think we can officially call ourselves urban farmers. We have 72 square feet of raised beds where we *try* and grow vegetables, but we’ve not really dedicated the time and effort necessary to make it produce largely for us until now. That being said, over the past few weeks, we’ve enjoyed lettuce, cauliflower, and broccoli from the garden, and have some heads of kale that are growing really well. We planted some fruit trees that are sprouting new growth, and this past weekend put in an entire bed of strawberry plants – 50 total, to be exact. My dad keeps asking, “what are you going to do with all of those strawberries?” And the answer is, eat them. Because, yum. We also planted garlic. A lot of it. I put some in the raised beds, which Elliot dug up. Some survived, others not so much. But I also stuck cloves in the ground all along the back edge of the yard, just to see what happened, and they all sprouted! Who knows if they’re making heads of garlic down there, but I’m excited to find out once it’s time to pull them later this summer. 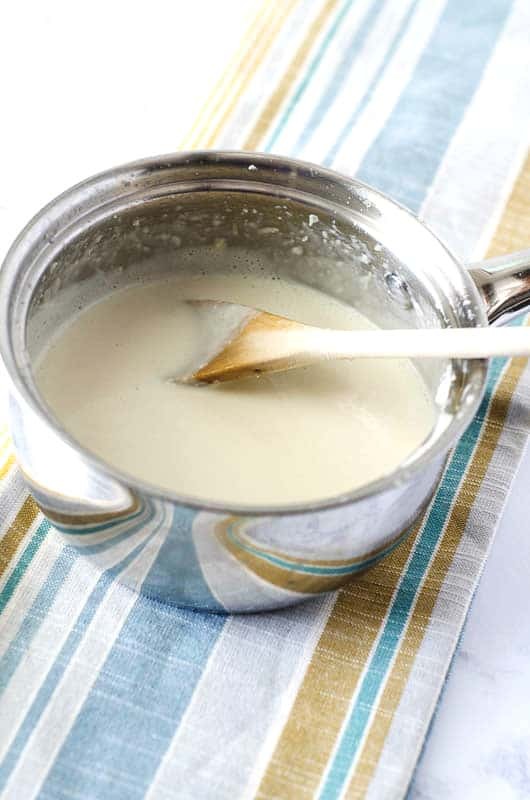 And if I do get a bunch of garlic from it, I am totally making batches and batches of this garlic cream sauce. Let me just tell you how easy this garlic cream sauce is to make. Seriously. It’s stupid-easy. And stupid-good. You can make it while dinner is cooking, or while you’re prepping something else, and it’s almost completely hands-off, which makes it worth its weight in gold. All you’re going to do is melt the grassfed butter, drop in your chunks of shallots and garlic cloves, and let them simmer until they get soft. You don’t need to watch it – go work on whatever else needs your attention in the kitchen, and come check on them in about 10 minutes. Once they’re tender, you’re just going to add the coconut cream from the can to the pot and allow it to heat up and melt. If you’re not sure how to get this, it’s just the “cream on top” when a can of coconut milk has separated in the fridge. Just stick the can in the fridge for at least an hour (I just store one in there to always have it) and then when you open it, the cream and water will have separated. Reserve the coconut water for a smoothie or other use, and put the coconut cream in the pot. Once it heats up and gets smooth, remove the pot from the heat. 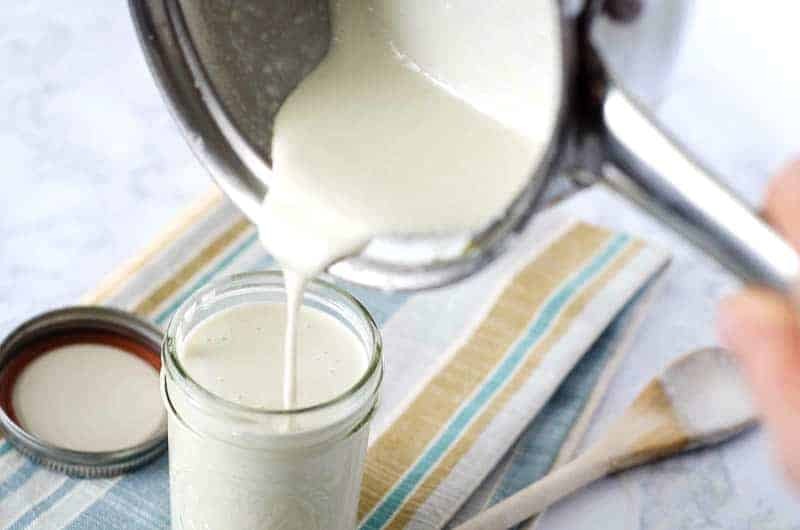 Use your immersion blender (most essential kitchen tool ever, second only to the food processor) to blend everything up until you have a smooth and creamy sauce. 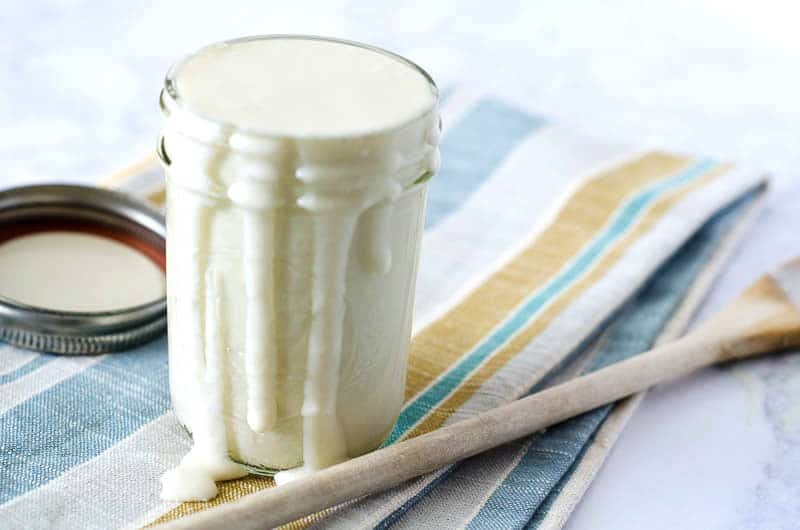 This garlic cream sauce can be stored in a jar in the fridge for a couple of weeks. Oh, and did I mention it can go on pretty much anything? So far I’ve used it on a sausage, pepper and onion mixture, on potatoes, on fish…literally anything that benefits from garlic or from sauce is game. So, yeah, basically everything. In a small saucepan over medium heat, melt the butter or ghee. Reduce the heat to medium-low and add the shallots and garlic. Allow to simmer for 10-15 minutes or until tender. 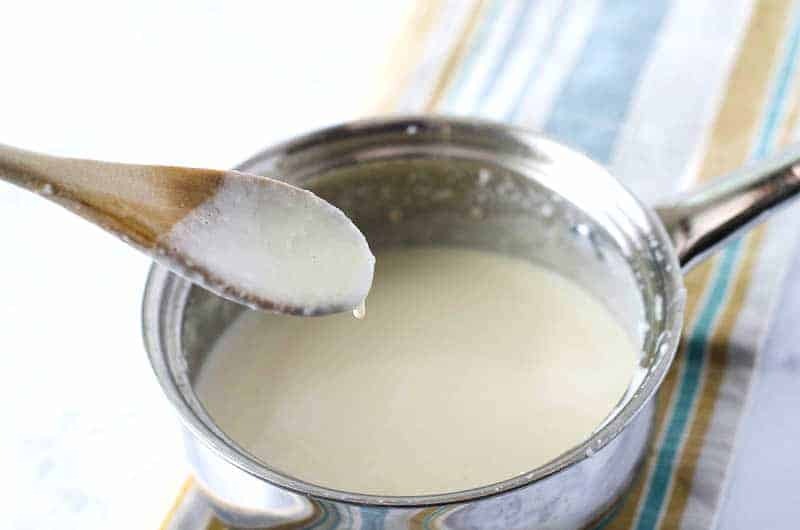 With the separated can of coconut milk, use only the cream. Reserve the water for another use. Add the cream and the pinch of salt to the pot. Stir until melted and smooth, then remove from heat. Use an immersion blender to blend everything together until a smooth consistency is achieved and no chunks of shallot or garlic remain. Store in a sealed jar or container in fridge for up to 2 weeks. The amount of garlic used in this recipe will greatly affect the intensity of the garlic flavor! If you are a big fan of garlic, then you may want to add more cloves to make it stronger. If you like a milder garlic flavor, you may want to add less. If sauce is too thick for your liking, add a tablespoon of the reserved coconut water to thin it out if needed. This literally made less than a serving of sauce. My husband and I shared this on our zucchini noodles, but there wasn’t really enough for both of us – we had to make an additional batch to get enough flavor. Side note – this sauce actually tastes pretty bad, so I added about 1 tbsp of pesto, and it was delicious! Thanks so much for your comment! I’m sorry you experienced issues with the recipe. 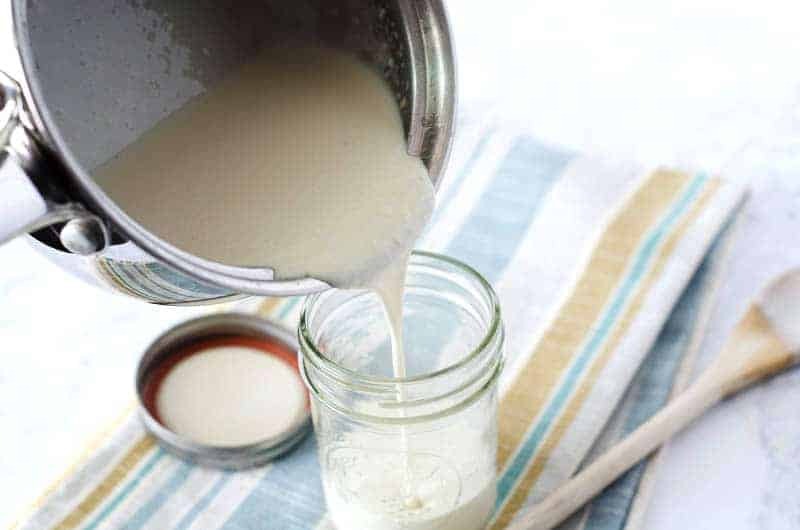 When made with a 14-oz can of coconut milk, the recipe fills a small 8 ounce mason jar, which was more than enough for my husband and me. If you really love sauce, then doubling it is certainly a great idea! The amount of garlic you put in will also greatly affect the flavor – I’ve gone ahead and added a note to the recipe for people to add more or less garlic to taste based on their personal preferences. Thanks so much for pointing that out! In regards to the sauce tasting bad, I’m sorry you felt that way. 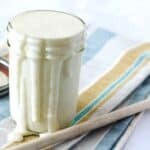 Coconut milk is definitely an acquired taste for some who haven’t used it regularly before, especially if you’re expecting it to be similar to the flavor of dairy. I use it as a healthy alternative, and since everyone’s taste buds are different, I’m aware not all the flavors I make will please everyone. Thanks again for your thoughtful feedback, and for trying the recipe! This sauce is AMAZING! Finally, a creamy paleo sauce without overwhelming coconut flavor. Personally, I used this sauce to sautéed scallops and asparagus and it was MORE than enough for 2 servings. I find myself thinking up different dishes just so I can make this sauce again and again. Thanks, Jess for this gem! This turned out great to use as an alternative to cream soup in a casserole recipe. Plenty left over for another meal as well. This was delightful!! I am so happy I found this! I have been looking for a cream sauce to go on my miracle noodles and this will be my go to! Thank you for sharing! Hi Grace, I’m sorry I didn’t see this comment before you made it – how did it turn out with the coconut oil? My guess is that it would be a little less creamy and might give it more of a coconut flavor. You could definitely increase the amount of garlic to take over that, but I imagine the end result would still be yummy. Let me know!